This Candy Cane Popcorn is perfect for the holidays! Friends will love to munch on this at a party and who wouldn’t love to receive a batch as a gift. Easy and delicious. Popcorn is one of our favourite snacks. It’s not just for movie watching. We love it for road trips and game nights and with this candy cane popcorn, we love it for the holidays. It’s been a long time since I made popcorn on the stove. I got into the habit of just buying bags of white cheddar snacks or making it in the microwave. Lately, with all the recipe testing, the stove top method has become a go-to and I have mastered making it on the stove. It’s super easy and takes minutes, and you control what goes into it. Just add coconut oil to a large pot. Heat the oil and when you see that the oil has liquified, add a kernel or two to the pot. As soon as that kernel pops, you know the oil is ready. Add the kernels and give it a good swirl, ensuring that all the kernels are coated in the oil. Put a lid on the pot, leaving it a little ajar and enjoy the popping. As soon as you hear the popping taper off, take the pot off the heat. The kernels will continue to pop. This popcorn is so festive. With a drizzle of white chocolate and a sprinkling of crushed candy cane, it suddenly becomes the perfect snack for the holidays. Serve in a big bowl at your Christmas or New Year’s party. Better yet, package into a bag or tin and gift it to your favourite people. In a large pot, melt the coconut oil on medium-high heat. When the oil has liquified, add in one or two kernels. Once they pop, you know the oil is ready. Add the kernels and swirl the pot until they are fully coated with oil. Add a lid, leaving it open just a touch and the popping will begin. When you hear the popping slow down, take it off the heat and wait a couple minutes. Spread the popcorn on a couple baking sheets. Melt the chocolate in the microwave in 30 second intervals, stirring after each 30 seconds. 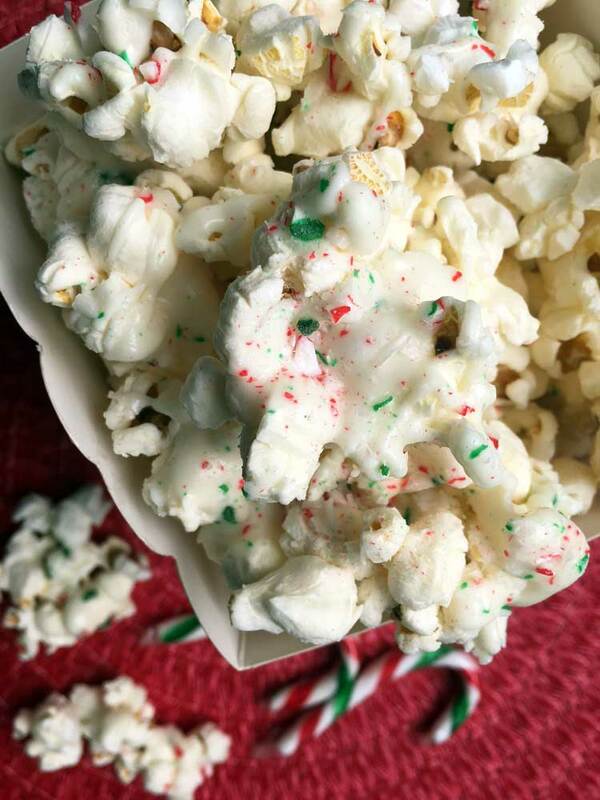 Drizzle the chocolate over the popcorn and sprinkle with crushed candy canes.